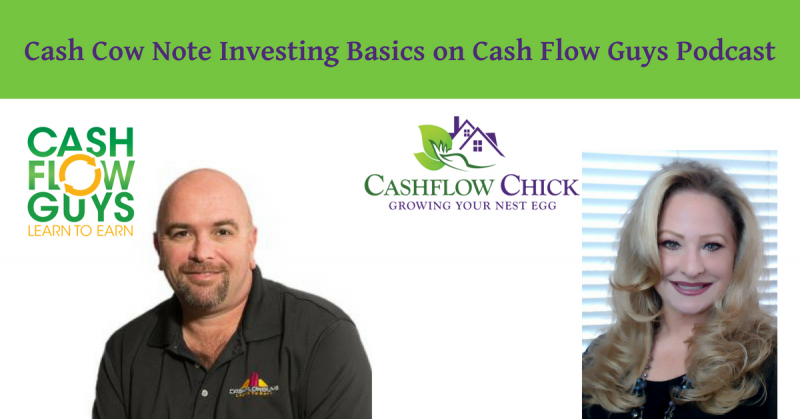 Working smarter not harder is the focus of this episode as Paige Panzarello of CashFlowChick.com and Tyler Sheff of CashFlowGuys.com discuss putting our money to work for us, instead of us working for it. Paige and Tyler have spent the last year or so building a team to acquire non performing notes and service them effectively for our investors. We take this opportunity to discuss a general overview of what exactly “notes” are, the ups and downs of the note investing business and how we can profit from “paper”. We buy notes at a significant discount….these are notes that are “non” performing” which means the borrower has stopped paying. The banks desire to sell these non paying notes at a discount to “clear their books”. Often we find that the banks have not even bothered to reach out to the borrower to find out why they are not paying. When we buy these notes, our team is able to reach out to the homeowners and often make arrangements to lower their loan costs or terms to allow them to start paying again. More often than not we can make arrangements with them that allow them to get their life on track and often remain in their home. The #1 most important element of investing in notes is the Due Diligence element. We have invested a great amount of time and focus on building the right combination of people needed to be sure our due diligence is effective and protects us from unnecessary loss. When working with investors, it is critical to be sure that we are extremely thorough in our research to protect our investor’s capital investment and future profits. In future episodes we will be digging deeper into the note investing arena and providing further insight into this mysterious yet highly profitable venture. Are you stuck as an investor and not sure what to invest in or what a good deal is? Are you overwhelmed at the educational options available to you in the marketplace? Would it help you to spend 30 minutes on the phone with Tyler in order for him to help you get “un-stuck” if so head on over to CashFlowGuys.com/AskTyler to book a free strategy session with Tyler to get on track today.